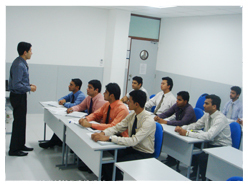 Keeping the above in mind as reasons which lead to deviant behavior on the part of the ship staff the course on interpersonal skills and conflict management has developed and is aimed at identifying these conflicts at an individual / group level and aimed at strategy to resolve the issues. To learn to apply the underlying principles of interpersonal relationships and enhance interpersonal skills in order to enable smooth operations and administration on board the vessel. To develop and insight into self in order to identify ones weakness and reasons for interpersonal conflict.